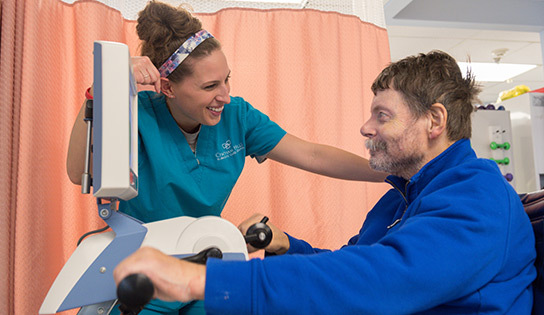 Our mission at Chatham Hills Subacute Care Center is to support our patients and provide unprecedented levels of genuine care and customer service for our community’s rehabilitation and nursing needs. Our approach and personalized treatments will ensure that our patients are back on their own two feet as promptly as possible. Martin Luther King Jr. once said, “if you can’t fly then run if you can’t run then walk, if you can’t walk then crawl, but whatever you do you have to keep moving forward.” Linda’s situation brought this quote to life. She has an extensive history when it comes to her health. She had a right and left total hip replacement, extensive spinal fusion surgery due to scoliosis and an active intracerebral bleed. No matter how many things seemed to go on the wrong path for Linda, she continued to keep moving forward. Linda was going in her house from her patio on what she thought was going to be a normal Friday. Unfortunately, when Linda was walking into her house, she missed a step. She fell while holding onto a grill to break her fall. As if the situation could not get worse, she fell and the grill fell on top of her. She was then rushed to St. Claire’s Hospital. After multiple tests, she was left with a left pelvis fracture and three broken ribs. After getting treated in therapy at the hospital, Linda was informed that she would need extensive rehabilitation services. When Linda first arrived at Chatham Hills on January 8th, she required contact guard assistance from a therapist and could not climb any steps. Linda expressed her strong feelings and intentions, “I want to be able to put weight through my foot, function, and walk and get better.” Her highly trained therapists took the time to make a treatment plan designed with her intentions in mind. With a set schedule of therapy six days a week, she was ready to begin healing. Linda presented with weakness, pain and a decline in mobility. At first, she was able to tolerate light strength exercises, balance, and endurance. Every day she participated in self-care tasks like getting herself dressed and getting ready to start the day like she would be doing at home. Completing her strengthening tasks, she was eventually able to stand! She got up on her own two feet and started to use a walker! Linda progressed quickly from her treatments which lead to her overall condition improved as a result of her skilled therapy sessions. While Linda was at Chatham Hills, she developed close relationships with a number of nurses, our concierge director and especially, her therapists. It took only a little over two weeks, a strong support system from her family, a supportive team of physical and occupational therapists, nurses and physicians to help Linda make a full recovery. Team Chatham Hills is so proud of what she achieved. Congratulations to Linda on her success here and continued success at home!